Do You Know Who's Backing Up Your Website? Do You Know Who’s Backing Up Your Website? We’ve been building websites for local service based business owners since 2007. Since that time we have yet to speak with a customer or potential customer who actually had the answer to this question, most had absolutely no idea if their website was even being backed up at all. This is not good and puts your business and website at serious risk. Who’s Backing up your website is something every single business owner should be asking their web developer. This becomes even more important if you are extremely active with adding new content to your website such as blog posts and photos. It’s also critical so you don’t lose any of your sensitive information that might be stored within your website software. 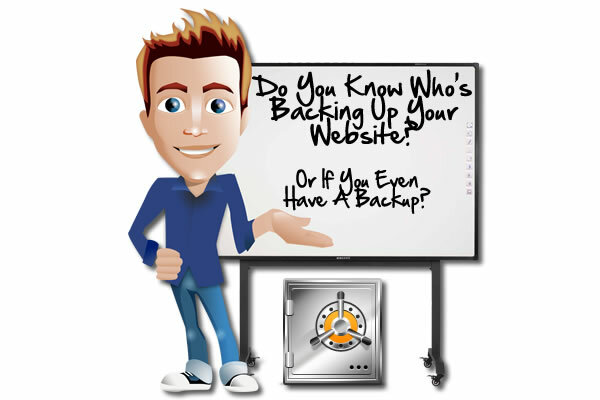 Why Would You Need A Website Backup? These events are all unpredictable and they do in fact happen to small business owners just like yourself. If you’re not employing some type of backup system for your website then you stand to lose, don’t assume your web developer has copies of everything often times they don’t have the most recent or most complete backup. Sites4Contractors.Com maintains a triple layered backup system for our client websites. It means we back up your website 3 different ways. We take an initial full account backup when the site is launched. This is provided to you and us for your safe keeping. If you’ve ever had your website hacked, or a had a server hardware malfunction you’d know the value in a good solid set of backups. By maintaining a triple layered backup system we can maintain your data in variety of different ways should anything ever happen to one of the other copies, let’s say the server building burns down. Well that would be OK because we maintain an “off-site” backup and you’d have a copy too. So hours and hours of work won’t have to be redone. Restoring your website will be just a couple of clicks.